I was having a conversation with someone the other day, that inspired this post. It's hard to lose weight, we all know that. Some who have lost significant weight may even tell you it is the hardest thing they have ever done. Unfortunately its actually quite easy to think you are doing everything correctly when in actuality you may be making a few mistakes that are holding you back from losing weight faster. Maybe you started running, or a new cardio routine, you read about what everyone else is doing and you thought you'd start doing it too. Those things may consist of taking in energy bars, sports drinks, etc... But what a lot of people may not realize is, a lot of those energy bars and sports drinks are designed for endurance sports. What is an endurance sport? Well that is for you to decide. But generally I believe the consensus considers them 2-5+ hours of physical sport activity. Long term activity depletes the body of certain nutrients. In which some energy bars and sports drinks are designed to replenish the body with the lost salts, sugars, etc.. That the body needs to continue to push harder for longer. So, in other words, someone who works out for 45 minutes to an hour and a half a day may not want to fall into the energy bar and sports drink pitfalls. Why? Because if you do, you may find that you aren't losing weight as fast, and might even be gaining weight. Sound crazy? It's true! I don't want to single out any specific energy bar or sports drink. But if you don't believe me, take a hard look at the ingredients. Don't let the words Organic, Whole, Fiber, Protein, that they may list in larger print detour you. Look at the smaller print. There are several things to consider, but look at the two main things that can stop you from losing weight. How many grams of sodium does it have? How many grams of sugars does it have? I took one of the more popular energy bars (we will leave names out) and I compared it to a 12 oz. popular soda pop brand. What did I find? Well there was so much sugar in the energy bar, that if I ate 2 of them, I might as well drink a soda because the soda had less sugar. 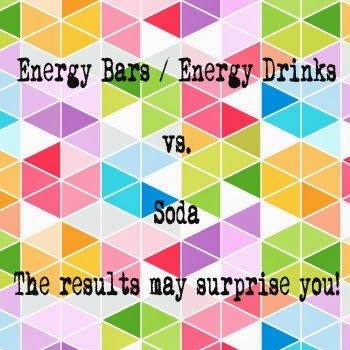 Additionally, the soda had 80 fewer calories than only 1 energy bar did... Seriously!!! Next I compared one of the more popular 12 oz energy drinks on the market and compared it to a 12 oz popular brand of soda pop. Believe it or not, the sugar intake was almost exactly the same as the soda pop. The sodium was off the charts higher, 9 times higher in the energy drink. In the calorie comparison, I found the soda had only 20 more calories than the energy drink did. However, we all know drinking soda isn't going to help you lose weight. So maybe the above information will give you something to think about before you decide what to fuel your body with. I know there are certain items on the market that may have fewer calories and may not compare exactly like the 4 items I chose. But not everyone knows about smaller brands, and the fact is when someone is starting out trying new things, they go with the more popular brands. My point of this post, is purely not to put down any one energy drink or bar, because when it comes to endurance sports, yes they have all those things in them to help you for a reason! But more as a reminder for someone who may eat/drink these things each day as part of their exercise/diet routine. Think about how many calories you are burning, and compare that with what you are in taking. Even though you may be thinking it's good for you because they are recovery bars/drinks. They may actually be the thing that is holding you back from losing the weight your trying to lose! I am a nutrition teacher by trade and this information is SO true! People need to realize how many calories are in those bars/drinks and they are really meant for people who are engaging in those "endurance" sports. Also people need to realize the difference between "energy" drink and "sports" drink! Great post! Great post! Very interesting! I mainly drink water but I have tried Nuun tablets in my water when I run more than three miles during the summer. I've never liked energy drinks or even sports drinks. I have had protien bars and this explains why they left me feeling "jittery". I must not have been active enough! Thanks! I haven't tried Nuun myself, but I have heard they are a better alternative! Okay, I thought I'd already commented on your post today, but can't remember for sure! If I did, and you just haven't approved it yet, or something, just delete this one! Anyway, it's so important to read the labels on anything you consume. Many things that are passed off as "natural" or healthy really aren't. You did, I appologize! I've been working on a new commenting system with comment luv, and it keeps disappearing on me. I think I have the kinks worked out for the future! But thank you for stopping by and commenting! But you are so right, it really is very important to read the labels!!!!! I never thought of it that way. I don't (or rarely) eat energy bars because too often I'm not happy with the ingredient list. Because I rarely eat energy bars or drinks I rarely think of these facts you pointed out. I am a water kind of girl. But as I increase my mileage, these are all great facts to keep in mind! Great post! Great post! I've never been a big fan of the energy drinks, mainly because I really do not like the taste, but my hubby has been known to partake in a few. It is pretty eye-opening to read the labels on those products (or any product really), especially since they are marketed as "healthy" options. I generally prefer water when I work out, but I'm going to go back to adding a few drops of water enhancement drops because I'm having salty sweat issues on longer runs. I've been doing really well with cutting back on soda, but I had a Pepsi after my long run today and it was divine. :) It was my one and only this week and it did the trick! Have a great week!